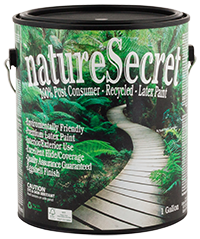 NatureSecret paint is a low-luster recycled paint that combines the benefits of quality primers, sealers, and exterior and interior water-based paints of all gloss levels. Our paint provides superior coverage on drywall, stucco, vertical concrete and cinder blocks, as well as old and newly primed wood at about half the cost of virgin latex paint. 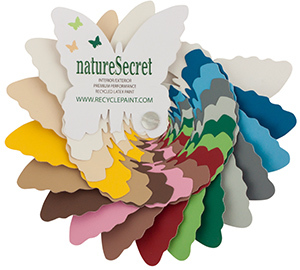 Now available in 26 colours, NatureSecret paint brings beauty and durability to any project, indoors or out.